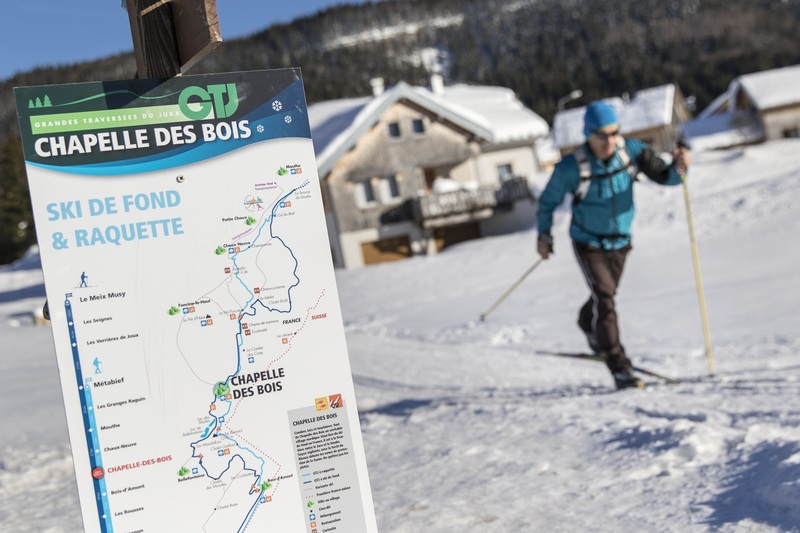 You will be on your own in terms of getting to the village of Lajoux, which is 20 minutes from La Cure train station and 40 minutes from the Bellegarde train station. You will check in at the Hotel La Haute Montagne, which is located in Lajoux. That first evening we will have a welcoming aperitif and you will find about how the following week is planned, followed by a dinner together with the whole group. You will prepare your skis for the next morning. After a hearty breakfast, your mini bus will take you to La Pesse, which is about 20 minutes away. During the day, you will pass near the Crêt au Merle, where you will see some magnificent vistas of the highest summits of the Jurassienne Mountains-- Le Crêt de la Neige—which rises to 1,720 meters. Then you go toward Molunes, where you will have lunch at the "Collège" which is a superb restaurant situated right along the cross-country ski trail. You will have two choices for returning to Lajoux. You can go through the small Laisia Valley or directly through the Platières. Either way you will do between 32 km and 34 km for this first day. At the Haute Montagne, take a beer, but remember to prepare your skis for the next morning. Then dinner. After a copious breakfast, you will go out for your second day of skiing. You will be headed toward the Massacre Forrest. There will be a short coffee break at the Frasse Chalet before you continue toward Darbella for lunch. In the afternoon, you will go through the Village of Prémanon as far as La Cure, quite close to the well-known ski resort of les Rousses. There you will stay at the French/Swiss hotel of L’Arbezie. The hotel lies directly on the border - one side you come in is French; the other side is Swiss. So, take your pick - eat in France or eat in Switzerland, in the same dining room! The same is true for the bedrooms that you choose to sleep in. This is a unique establishment, symbolizing in and of itself why we call this trip "without borders" Bérénice and her staff will offer you her locally famous cuisine. 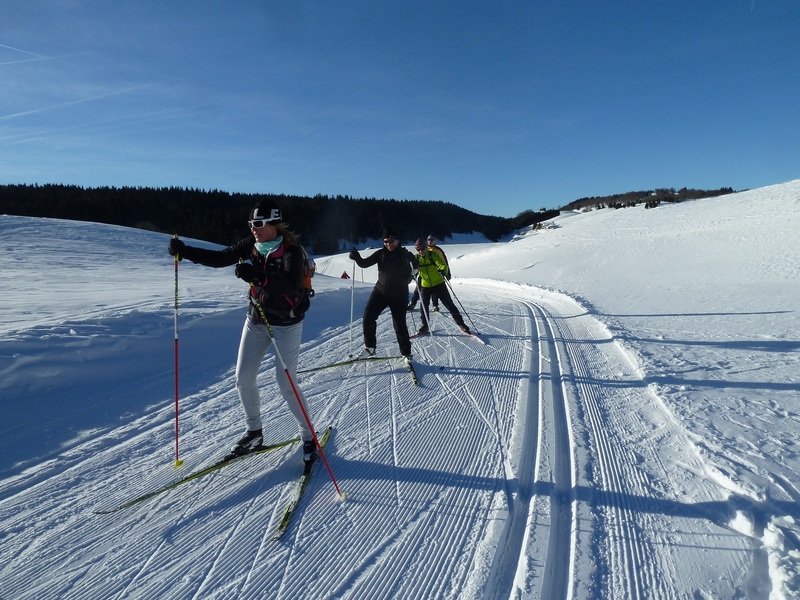 The third leg of your trip will be mainly on the famous Transjurasienne trail, which is the only French race that is part of the Worldloppet. For those of you who don’t know, the Worldloppet unites 16 of the best cross-country courses in the world. As you leave the Rousses village, you will see scenery all around you as you move on toward the village of Bois d’Amont (first 10 km by bus possible). This is truly a Nordic ski town which is famous for having been the home of a number of Nordic ski champions in France as well as those who have won races in the category combined Nordic skiing. A long uphill goes towards the Risoux Forest where you will have lunch at the Gaillard chalet, which is right before the Chalet des Ministres in the middle of the forest. You won’t be far from the summit of this imposing place. Then a long downhill into the Bellefontaine Valley during the afternoon where you will arrive at Chapelle-des-Bois. All the while you will be moving through sections of bogs and lakes before you get to Foncine-le-Haut where we will stay for two nights at the Grand Chalet Hotel in Foncine-le-Haut. There is a sauna and an indoor pool waiting for you to help you recover. In the evening, dinner will consist of local specialties. One good point to remember for this day is that you don’t have to pack in the morning because we are going to spend a second night at the same hotel. The route this Thursday goes in the direction of Chapelle-des-Bois before you cross the Combe des Cives to Pré-Poncet where there is an overhead bridge that allows you to cross the Highway. Lunch is planned at la Jaique which is situated at 1,380 meters where you will be able to see the Mouthe Valley. The return in the afternoon we will pass by Chez Liadet in Chaux-Neuve, a small village known for its ski jump that has been used for many World Cup competitions for the combined Nordic cup races. 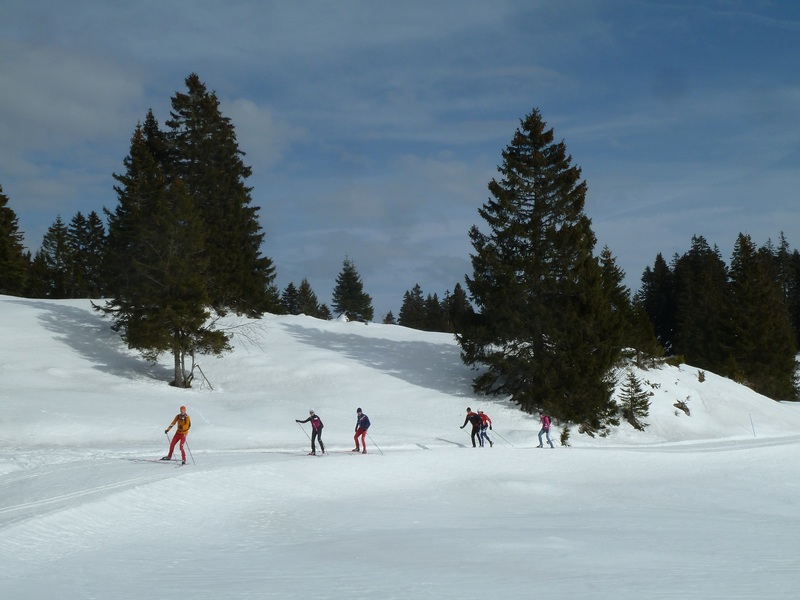 In the afternoon,you will have skied 30 to 35 km depending on which return route you took. Sauna, indoor pool, and dinner. You will start this glorious day at the Col du Mollendruz in Switzerland after having been driven in a mini bus from your hotel in Foncine-le-Haut. Plan on about a 40-minute drive. The magnificent itinerary today will allow you to explore wonderful terrain starting from the foot of the Tendre Mountain whose peak is at 1,673 meters. 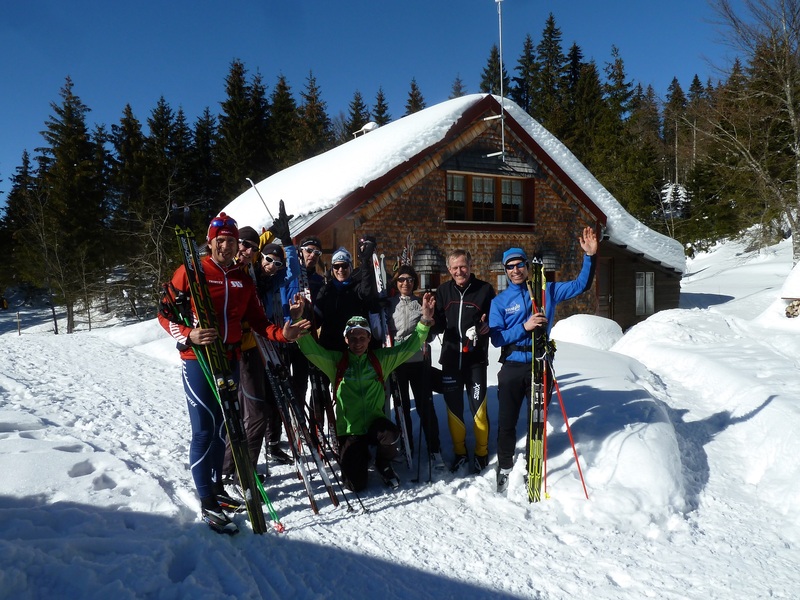 You will pass through the Bon Accueil refuge and go all the way to the Col du Marchairuz that you will discover after about 18 km of skiing. The track cross the road and continue in the general direction of la Cure where on the way you will stop at La Buvette des Pralets where we will take a break for lunch. Only 13 km to go in the afternoon to get to our hotel L’Arbezie, the same French/Swiss hotel that you were in on Tuesday. Before arriving at the hotel you will go through Baronne. Another hearty breakfast in the morning before the last stage of your trip. You will be going toward Lamoura, well-known for those who participate in the Transjurasienne races. You will go through the superb Combe Sambine. Lunch break at La Serra before you continue on to Combe du Lac and finally back to the village of Lajoux. There you will stay in the same hotel La Haute Montagne as the first two evening. Last meal together. Please make me an offer for the flight to the destination. I will arange my flights by myself. I need to rent the equipment. I want to include a cancellation insurance. Plaese send me an offer. The participant is responsible for the right insurance. In the event of an accident or disease there is no liability by us.